Renowned English MC Rodney P was in the country last weekend for the annual French celebration of music, Fete de la Musique. The 48-year-old entered the UK hip hop scene in the early 1980s, at a time when rappers in the country were trying to imitate American hip hop. Rodney was destined to change that forever. “As a young teen musician, I visited New York City to do some shows and for the first time, I realised the futility and stupidity of trying to be who you are not. My friends and I were talking in fake American accents because back home, we had been made to believe that to do hip hop, one had to do it the American way, including the American accent. When we went back home to the UK, we knew we had to do hip hop our own way,” Rodney P told Sqoop magazine. Rodney P had come out of hip hop heaven a changed man. He had seen the light and was destined to make disciples. London Posse, the group he belonged to at the time, the same group that had just arrived from New York would change the hip hop landscape for the rest of the world forever. “In 1987, when we released our first song as London Posse, people said hip hop was American and should be sang in American accent. We said no and changed the game. The song did so well locally and internationally, so much so that at that point, rappers around the world realised they didn’t have to parrot the Americans to do hiphop music.” he says.Today, Rodney P has had one of the longest and most respected careers in UK hip hop, and he has shared the same stage with hip hop greats such as Jay-Z, Alicia Keys, Jazzy Jeff, Dead Prez and Mos Def. He believes that they managed to become stars after switching to their regular British accents and London Posse would go on to become one of UK’s first home grown hip hop acts, who were highly influential in the development of the genre. According to celebrated UK producer, DJ Skitz, Rodney P is considered by many as the godfather of the genre by a large section of people in the UK and beyond. UK hip hop was not UK hip hop before Rodney P.
DJ Skits is a celebrated UK producer who also changed the game in his own way. In 2001, Skitz released his debut album Countryman, which is considered ground-breaking in the British Hip Hop genre. The album reflected his rural upbringing and according to Skits, helps define the simplistic life most of us strive for. Rodney P was featured on the album, among other major UK rappers. A BBC review said Skitz “delivered a consolidation of talent and attitudes of a musical movement that has been both struggling and hugely underrated for too long” and that it was “perhaps the best illustration of the state of homegrown hip hop today”. 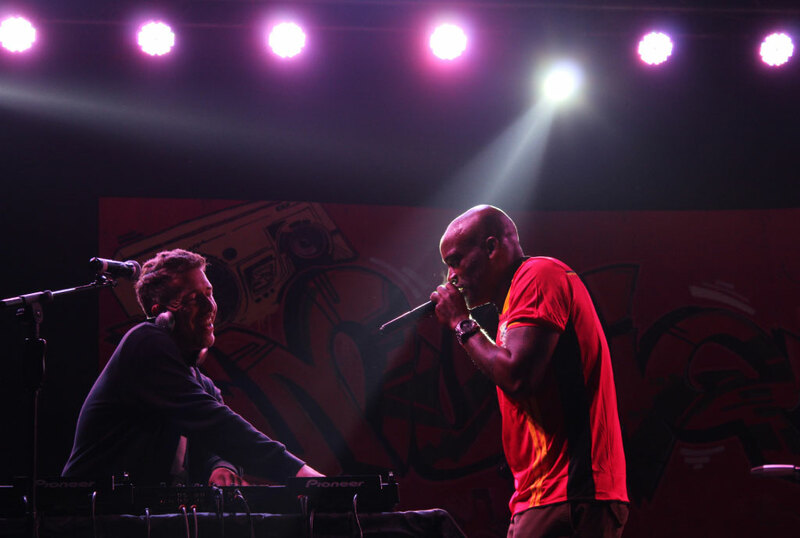 Last weekend’s concert was one of the dozens of projects DJ Skitz and Rodney P have undertaken together as friends over the last 20 years. Though they are separate stars with different careers, their mutual love for hip hop and reggae music has bound them together in unending collaborations. The two stars also spent a week recording music with young Uganda hip hop acts Joram MC, MC Yallah, Blaq Bandana and Ecko Bazz at the Muyenga-based East African records. An official at the record label believes these Ugandan acts have a chance at selling their music in the UK.